The birth of the Sunrise Movement started with a small grant, a lot of Monster Energy drinks and a little help from the Sierra Club. Now it's the most talked-about environmental group in Washington. Whether it can turn the buzz surrounding it into actual change will depend on how much its young leaders have learned from the fizzled Occupy Wall Street movement — and the degree to which the country is ready to embrace its ambitious vision of a wholesale transformation of U.S. society. Co-founder Evan Weber, 26, thinks that it is. "We are seeing a lot of hope from our generation in a way that makes me believe we can actually do something really big," he said. More than that though is Weber's belief in the way the Sunrise Movement is trying to convince Congress to undertake a massive program to fight global warming — in the same way that former President Franklin D. Roosevelt used the New Deal to combat the Great Depression. "We think to win on climate change we have to be part of a broader movement to [rewrite] what government should be for," he said. That movement burst into view with a surprise protest Nov. 13 outside the Capitol Hill office of Rep. Nancy Pelosi (D-Calif.), the likely next speaker of the House (Climatewire, Nov. 14). Dyanna Jaye, 26, Sunrise's campaign director, said the rally — which resulted in the arrest of 51 protesters — was one step in a process that began years ago but is poised for a breakthrough. Another Sunrise Movement protest is planned for Dec. 10 in Washington, and organizers hope to surpass the 200-plus activists who showed up the last time. "We have a very limited window of time to influence the agenda of the next Congress," Jaye said. Weber said his interest in climate activism is rooted to his hometown on the island of Oahu in Hawaii, where environmentalism was "sort of second nature, if you pardon the pun." Weber grew up playing on several beaches he said no longer exist because of rising sea levels. "Living on an island, it becomes very apparent very quickly what we do as humans to the natural environment," he said. Weber attended Punahou School, where former President Obama graduated. The young activist said he was inspired that "someone who came from my little island could have such a positive impact on the world" — though Weber would later add that he was disappointed Obama didn't do more to address global warming. "He had fundamentally failed to fulfill many of his campaign promises," he said. "In particular, this was incredibly true on climate change." Weber left Hawaii to attend college at Wesleyan University, where three life-changing events happened in rapid succession. Most significant was the death of his father his freshman year, who suffered a heart attack as he was riding a bike. "After my father passed away, I realized how precious time is and how much I had been taking it for granted," Weber said. The next was his participation in the Occupy Wall Street movement of 2011, which held the public's attention for about a month as protesters tried to raise awareness about income inequality. "Ever since that moment I knew in my soul that if we were ever going to take action on climate change in this country, that we were going to have to do something like that," he said. The third was his friendship with Matthew Lichtash, another Wesleyan student who also was studying economics and environmental policies. With the help of green activist Michael Dorsey, a visiting professor at the time, the three landed a $30,000 grant to spend summer 2013 writing a plan on how to save the world from climate change. "It was heads down for a good two months," said Lichtash, who got his caffeine fix during that time from Monster Energy drinks. Weber preferred tea. "We're still very good friends despite my love of Monster and his lack of love for Monster," he joked. Lichtash said the Sierra Club allowed them to use its Washington office near Union Station as a home base to craft an environmental action plan that was "commensurate with the scale of the climate crisis." "It wasn't lost on us that this was incredibly ambitious," Lichtash said. The result was a roughly 35-page treatise that relied heavily on carbon taxes — an idea that Weber recently mentioned in connection with his pitch for a "Green New Deal" (Climatewire, Nov. 19). Other suggestions ran the gamut, including a phaseout of fossil fuel leases on federal lands and the creation of a blue ribbon panel to address the climate crisis, Lichtash said. "We didn't have a 'Green New Deal' specifically," he said. "We had a commission that would discuss things like that." Once the writing was done, the team tried to build support and attract attention. "We realized the next step was to build out and advocate around this plan," Lichtash said. That led to the creation of a group called the U.S. Climate Plan that Weber said was incorporated in January 2014. About this time, the two friends began pursuing separate avenues of activism. Lichtash would go on to join the New York Power Authority — promoting electric vehicles across the state, he said — while Weber waited tables and did bicycle deliveries while he tried to get the climate plan off the ground. For Weber, that included networking with other environmentalists, like those involved in efforts to get universities and other institutions to divest from fossil fuel. It also meant trips to major events, such as a 2014 climate protest in New York City where he met Jaye, a co-founder of the Sunrise Movement. For Jaye, global warming is a local problem. She grew up in Hampton Roads, Va., where nuisance flooding is common. "Every time a storm hit, we had weeks off from school," she said. After graduating from the University of Virginia in 2015, Jaye was in Paris that winter for the international climate summit, where she led a youth contingent pushing to zero out fossil fuel emissions by 2050. Before the final agreement was drawn up, Jaye and her peers had a problem: United Nations rules banned certain types of visual demonstration. So they drew zeros in black-and-white paint around their eyes instead. 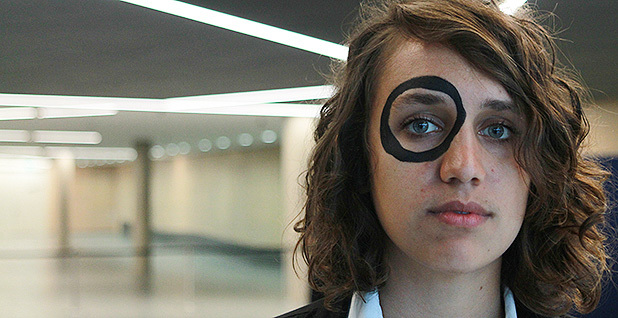 "We had hundreds of young people walking around the U.N. with zeros painted around their eyes," Jaye said by phone. "Young people would sit in these rooms with paint on their faces." The final deal, the most ambitious global climate accord in history but still short of what scientists say is necessary, brought mixed emotions. Jaye said it quickly sunk in that it wasn't enough. "I felt that sense of devastation coming back home," she said of the talks' aftermath. "It made me recommit." That sort of urgency is central to Sunrise's pressure campaign against veteran Democratic lawmakers like Pelosi. "It was definitely a powerful moment," she said of the sit-in at Pelosi's office. "We want to bring that to the halls of Congress." One hurdle for Jaye, Weber and their allies was the difficulty of launching a new advocacy group in an arena where there are plenty of established environmental organizations. Then too was the challenge of trying to shepherd young people into a sustained movement — a problem both Democrats and Republicans puzzle over, often unsuccessfully, every two years. Solving these problems was part of the reason it took nine months of planning before the early Sunrise team launched the group in April 2017. One factor working in their favor was that the group didn't start from scratch. Some of the architects of the Sunrise Movement included activists from organizations such as 350.org — which also provided some early financial support. Among the co-founders were Sara Blazevic and Varshini Prakash. 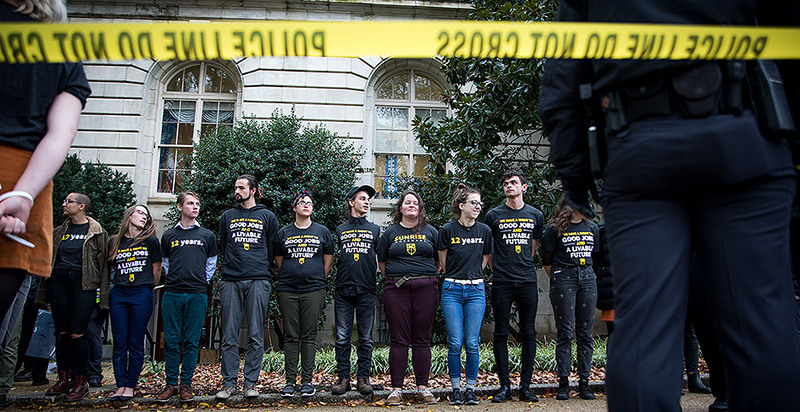 Both came from the Fossil Fuel Divestment Student Network, whose goal was to pressure universities and other institutions to divest from the oil and gas industry — often in a public fashion akin to the protest outside Pelosi's office. Blazevic led a 33-day divestment sit-in at Swarthmore College in 2015; Prakash did the same at the University of Massachusetts in a 2016 event that resulted in 34 arrests, according to Sunrise officials. Yet both said they were unsatisfied in the progress they were making, and each viewed the tumultuous 2016 elections — which saw the rise of Bernie Sanders and Donald Trump from different ends of the political spectrum — as proof that a change in direction was needed. "I was proud of our divestment work, but I could tell that if we didn't evolve, we would never build enough power to actually stop climate change," Blazevic said in a statement. "I could see us entering a period of massive political upheaval." Prakash added: "It was clear to us that a lot of big environmental organizations were pretty baffled and confused by the rise of new political figures like Sanders and Trump." In the back of Weber's mind was the challenge of how to avoid the mistakes of the Occupy Wall Street protests — notably their inability to maintain momentum after they captured the public's attention. "It had the flash-in-the-pan moment, but there wasn't a clear direction of where the movement could go," Weber said. One fix was through better organization. The Sunrise group's first appearance was a climate protest in Washington, where the team canvassed attendees to build support. That helped lay the groundwork for a major calling card of the group — what it calls Sunrise Semesters. "When we launched the movement, our first major task [was] to build an army of young people to make climate change matter in the 2018 elections," Weber said. Supporters would join the group for several months — a semester — as if they were on a traditional political campaign. The first attempt yielded about 85 folks who worked across five states during the 2018 elections. A big social presence was also key. When Pelosi released a statement last month on Twitter agreeing with Sunrise's ambitions but not signing on to its policy goals, the group fired back. "Almost there @NancyPelosi!" Sunrise tweeted. "We need you to embrace @Ocasio2018's proposal for a Select Committee on a #GreenNewDeal. @HouseDemocrats must spend the next 2 years developing a plan & building support to transform our economy over the next decade. You have the power! You with us?" David Turnbull, a longtime environmental advocate with Oil Change International, said Sunrise runs an impressive online operation. "It's a generational thing too, right?" he said. "These are people that are fluent in online tools." A driving motivation, Weber said, was to make the Sunrise Movement the "cool kids in the climate movement." The group hasn't shied away from its millennial roots either. A fundraising drive on its website encourages its backers to "sponsor a millennial to fight for you." "We are giving our time, but we need your help to pay basic living expenses" is the pitch. A donation of $800 sponsors a millennial for a month; $4,800 equals six months. In this case, at least, time could be a weapon for the Sunrise Movement. Earlier this year, the Pew Research Center projected that millennials were poised to overtake baby boomers as the largest adult generation in the U.S., as well as its biggest eligible voting bloc. In relation to other environmental groups, the Sunrise Movement is relatively small. Its officials said they have about 16 full-time staff and that they've raised about $1 million since its founding. The group rents space from the Sierra Club in Washington, though officials in both groups said Sunrise is independent. "This is their platform, and they are pushing it their own way," said John Coequyt of the Sierra Club. The two groups do have a common mission, however, and Weber said the Sunrise Movement received a $50,000 grant from the Sierra Club Foundation. Weber said the group tries to build momentum by focusing on targeted actions. It rallied at congressional town halls in a redux of the tea party protests of 2009 and 2010. And the Sunrise Movement was integral to a campaign this election cycle that encouraged lawmakers — mostly Democrats — to sign a campaign pledge not to accept money from fossil fuel industries (E&E Daily, Sept. 7). One backer of that pledge was a little-known House candidate from New York named Alexandria Ocasio-Cortez. "She was someone who was very passionate about climate justice," Weber said. The Sunrise Movement backed Ocasio-Cortez in her upset primary victory over Rep. Joe Crowley (D-N.Y.). And when the Sunrise Movement decided to protest outside Pelosi's office a week after Election Day, she stood alongside them. "Obviously we had added star power and firepower that took it through the roof," Weber said. The timing of the protest wasn't an accident. The Sunrise Movement planned to strike first once Congress went back into session after the elections. "We knew there was a critical period of time after each election where agendas are set and groups can influence" the debate, Weber said. So the thought was, "What if we do an action in D.C. the week after the election before anyone else is ready to move?" The gambit worked. Not only did the protest attract plenty of attention from the Capitol Hill press corps, but the presence of Ocasio-Cortez fit into a broader narrative about infighting among congressional Democrats — further fueling media attention. In the aftermath, Weber said the group's Twitter followers tripled to about 30,000 followers, and it has increasingly become the go-to group among young environmentalists looking to influence the next Congress, particularly with its message of trying to combat climate change through a massive program like a "Green New Deal." Sunrise's protests elevated climate ahead of the new Congress, winning a thumbs-up from Pelosi, but the group quickly ran into the hard realities of the Democratic caucus. There is little open opposition to the group's message among House Democrats, but some prominent figures are noncommittal about its specific demands. That's especially true of Sunrise's demand that Pelosi establish a committee with broad legislating power to craft the "Green New Deal." Both Rep. Frank Pallone (D-N.J.), likely the next chairman of the Energy and Commerce Committee, and Rep. Raúl Grijalva (D-Ariz.), who's poised to lead the Natural Resources Committee, question the wisdom in giving lawmaking authority to a new committee, a key Sunrise position. A target of Sunrise protests, Pallone was confronted by activists who wanted him to sign a pledge rejecting fossil fuel campaign contributions. He refused. Shortly after, Pallone butted heads with Ocasio-Cortez at a private caucus meeting over the attempt to shift legislative power away from the committee he expects to lead (E&E Daily, Nov. 16). Some question the wisdom in targeting Pelosi. The longtime party leader has the backing of groups like the Sierra Club and the League of Conservation Voters. Even Ocasio-Cortez called her the most progressive candidate running for party leader. "An advocacy truism is that it's usually easier to pressure champions and allies because they share advocates' views," said Dan Weiss, a former political director for several environmental organizations. "However, without a majority of officials who support advocates' agenda, pressuring champions will do little to make advocates' proposals into a reality." Others reject this view. Mainstream groups are too complacent and unwilling to press party leadership to accept the gravity of the climate crisis, said RL Miller, director of Climate Hawks Vote. "Sunrise has succeeded in getting climate front and center where those groups have failed, if they were trying at all," she said. Sunrise's stance directly counters the bipartisan, incremental progress approach advocated by the Climate Solutions Caucus, which operates under the view that only cross-party collaboration will yield climate legislation. The group hasn't convinced GOP members to vote accordingly. Caucus co-founder Rep. Carlos Curbelo of Florida, perhaps the most prominent Republican who supports climate action, called Sunrise's tactics "truly deplorable" (Climatewire, Nov. 19). "I don't think those groups contribute very much," said Curbelo. "The solution to this is bipartisan compromise." But Curbelo will be gone when the new Congress begins. And Sunrise's "Green New Deal" has gone from a fringe proposal to one that's endorsed by nearly 20 members of the new Democratic Congress in a matter of weeks. One of those to sign on is California Rep. Ro Khanna (D), who headlined a press conference Friday on the steps of the Capitol in support of the deal. In an interview with E&E News, Khanna compared the Sunrise Movement to the student gun control activists who survived the Parkland mass shooting in Florida. "I love 'em," Khanna said. "They are young, passionate advocates. For them, climate change isn't theoretical. They know that by the time they're my age, they are going to have to deal with this." But with Republicans in control of the Senate and Trump in the White House, major legislation of any type is unlikely to become law in the next two years — regardless of what happens in Congress. Most environmentalists hope for some green spending as part of an infrastructure package, along with investigations into the Trump administration's regulation rollbacks. Paul Bledsoe, an energy fellow at the Progressive Policy Institute who worked on climate change in the Clinton White House, said Sunrise should look to integrate climate concerns into party priorities across the board over the next two years. Ripe areas include tax policy, mitigation in infrastructure spending, the national security threat posed by a changing planet and, in particular, economic opportunity. If climate is to matter in the 2020 campaign against Trump and beyond, the issue cannot stand alone, according to Bledsoe. "The Democratic presidential nominee is going to talk about climate, but he or she is going to talk more about economic opportunity," he said. "Sunrise knows that." Weber said his group's recent protests put Sunrise in position to be a player in the 2020 primary, where progressive cred will be a valued currency. The group intends to press candidates to support the "Green New Deal" and sign the no-fossil-fuel-money pledge. Those who do not can expect opposition and protests. On the flip side, any candidate who wins the backing of Sunrise would get an injection of energy from a fast-growing, youth-driven organization. "I've been watching (and assisting a little bit) the dawn of a Sunrise Los Angeles chapter," Miller wrote in an email, "and it's exciting and beautiful." Correction: An earlier version of the story misidentified the Sunrise Movement. We regret the error.